SEO / BirdLife is part of BirdLife International, one of the largest coalition of conservation organizations in the world. 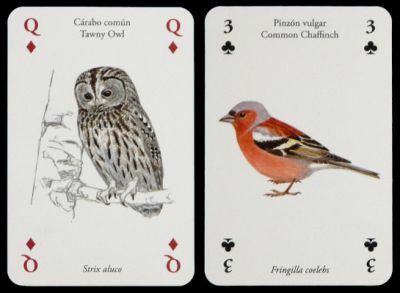 The 56 cards (there are four different jokers) have been illustrated by Juan Varela and present the most representative birds from Spain. The captions are in Spanish, English and Latin. It has been given to all ASESCOIN members assisting the 2014 annual general meeting. Price and where to find: 7 € everywhere. In www.seo.org/tienda, try “baraja” in “introduzca el texto a buscar”.